RV bumper hitch adapters. Fulton BA400 bumper mounted trailer hitch receiver. Caution: We recommend using for hitch mount accessories only! Bike racks, cargo carriers, ski racks etc. 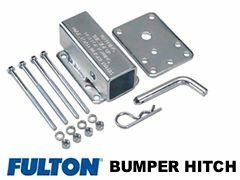 The Fulton BA400 RV bumper adapter bolts the hitch receiver adapter to your RV 4" bumper and allows you to plug in any 2 inch hitch mounted accessory. hitch mounted bike racks or cargo carriers. - Heavy duty construction, all mounting hardware included. See Caution note below picture.